I hope you’ll join me live later today at 3pm ET / 12pm PT for the party and an interactive Tips Tuesday recap and breaking news discussion on the BlogAid Facebook Page. You can also catch the quick recap later that evening on the BlogAid YouTube Channel. Skip to the 7:00 mark when I turned the sound on!! I hope all of my U.S. peeps enjoyed your long holiday weekend. I certainly did!!! Of course I made a nice turkey dinner, but I also spent time in my new wood workshop – getting everything out and better arranged. And, I also went tool shopping!!!! A couple of my clients sent generous gift cards and I hit those holiday sales to pick up a few new hand tools that are needed for the type of woodworking I’ll be doing. You can see my enthusiasm in the Facebook video I posted on Sunday. And, I’ve had a couple of folks express how grateful they are that the discounts last throughout the holidays and how they plan to purchase in December. I so get that!!! You’ve got to get those Black Friday deals for the family and need to do site stuff next month. And that’s precisely why I run these sales through the first of January. Some folks want to get a jump on tax write offs for 2019, so they purchase right after the turn of the calendar. I’m doing the same thing with my new woodworking endeavor. I need to wait until January for the power tool purchases, as those will be amortized. So, I try to make it easy for you to get in when you need to. Due to the holiday, we took a week off from our Google Search Console live labs in the DIY SEO course. But, we’ll be doing the last one this Thursday. So, go ahead and jump into the lab and get your questions ready for the live session. The meeting info is on the lab page too, so you can mark your calendars. Back on the old WP tutorial member site I had a bunch of videos on working with Genesis themes. But when I revamped the BlogAid theme this past summer, I realized how unfamiliar I was with the newer themes, and how to even build out the home page like the demo. Wow! Have things ever changed. Since then, I’ve had to postpone or even turn down business for helping folks revamp their sites. Well, I got new tutorials made over the weekend, and I have a client ready to make the leap to Genesis. So, he’ll be vetting the new tutorials. I know several of you are also wanting to do a site revamp right now, but you’re concerned about what may be coming down the pike with regard to Gutenberg. Don’t worry about that! I believe it will be closer to 2020 before we see the 2nd phase of Gutenberg roll out that will become a theme builder. And who knows how long before Genesis has that ability. So, do what you need to do to make money with your site right now and worry about later, later. All of my site revamp clients end up with a theme that costs way less than going through the process alone. So, don’t think you can’t afford to do it, or you’re wasting money right now. I know how glad I am that I made the leap and got it done!!!! That’s the news from around here. Let’s jump into this week’s tips. Genesis rolled out version 2.7 a couple of weeks ago and there were just a few bugs in it that were fixed with version 2.7.1. I thought another version bug fix was coming right behind it, but I guess they caught everything in that last update. I’m no longer hearing reports of any issues, so I believe it is safe to update for most folks. There were still a few critical bugs in WP 5.0 release candidate, so the public rollout of the final version has been delayed. That was supposed to have been yesterday. But, with the last RC being 4 days late, the full release had to be pushed back as well. I have yet to hear a confirmed date for the public release, and even if I do, I’ll believe it when I see it. WPTavern has a good post on the back channel conversation happening around the release of WP 5.0 and the timing. Practically everyone is screaming for it to be in postponed to the January date at this point. But, many folks, including the lead developer, is saying we needed to draw the hard date on the Release Candidate, even if that means there will be 4-5 weeks between it becoming available, and the final release rolling out. And that’s precisely where we are now – between a rock and hard place. Like I said, I’ll see it when I believe it, but this is a good post to read to get a gist of the conversation about it. In the meantime, you’ll want to read my post on the things you should do before, during, and after the WP 5.0 release. Even if you’ve read it, I’ve updated it, so scan again, please. We really need to know a firm release date because several of these items depend on when that will be – like when to and when not to update your plugins. I’ll be watching everything like a hawk and will do my best to get the word out to everyone about what to do and when. Most of those notifications will be livestreaming a BlogAid Today tip on the BlogAid Facebook page. I’ll also be posting to my Facebook groups for my Site Audit Plus clients and Webmaster members. And, if the news is critically important, I’ll be sending emails to those folks too. There sure is a lot for me to consider and plan for as I revamp the woodworking site. One of my major concerns is re-engaging with my email list. So, I found this post on Blogging Wizard particularly interesting. It’s got some great ideas for helping folks become interested in following you closely again. I’ve picked a few out to use myself. And even if you have an active list, read this post anyway. It might spark some ideas for getting folks to engage with you more, including just opening more of your emails too. Big subscriber numbers don’t mean anything if folks are not opening the emails. Tips Tuesday is a little shy on news this week as most sites I follow were squarely focused on holiday sales and had very few posts. 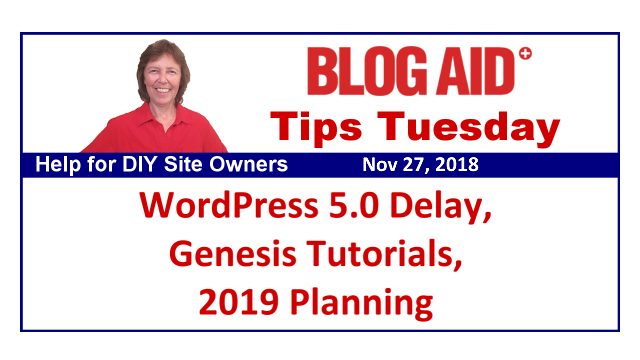 But, I do want to end with a tip for you to start getting ahead on 2019 and what you want to accomplish with your site in the coming year. If you made goals for your site in 2018, pull out that list and see how you did. Or just make a list of all the big wins you had this year. What did you miss the mark on? I actually missed doing quite a bit this year due to the house hunt hoohaa and GDPR and such that I didn’t plan on taking over my life like they did. And I won’t be going back to pick some of that up. It’s just too late. I’ve got other plans for BlogAid already in the works through the spring. Sometimes you have to let go of missed opportunities and just move on. Maybe it’s a good time to start daydreaming of how you want your life to be in the new year, and how your site fits into that picture. After all, the site is not the end goal. The life you want to live and share is the point, and that life feeds your blog and your audience. I’m looking forward to sharing my life in my new house, as I move back into my creative endeavors that honestly made my life worth living before BlogAid became my sole focus and took over what should have been my free time too. It’s good to step back and evaluate why you started your site, and compare that to what it has become. Now is a good time to step out of your hamster wheel of tasks and either get it back on track or find ways to rejuvenate your passion for it. That’s how you grow. It’s an evolution. Things change. Be willing to open yourself to new ideas and ways of doing no matter how big or small you are right now. And if you think you don’t have time to daydream, look at what’s taking up all of your time now. Maybe some of that can be let go. I know I was surprised to discover that if I set a clock out time every day, the sky didn’t fall and I could still get done what I needed to do for BlogAid and still keep you on top of the changes and ahead of the curve. I updated to the latest Genesis, after trying it on staging. All looks good on my end. Glad to hear it, Tammy!! I’ve updated all of my sites too and all is well. Glad we waited for that next bug fix!! Daydreaming has been great, Tipper. And just getting off the hamster wheel of tasks and opening to new ideas has been so helpful! !